When the average person thinks of Chicago, a few things hit the top of the list: the sports teams, the vibrant downtown scene and its iconic architecture… the wind (and for locals: confusing parking signs and that particular smell of the ‘L’). What does not immediately come to mind is the incredible array of outdoor spaces and field houses that make up the Chicago Park District. Chicagoans all over the city burst out of their winter hidey-holes to enjoy the fresh summer air and sunshine, and people from the world over come to the more well-known parks for events like Lollapalooza and countless other festivals and events. So, why is DancerMusic so interested in happenings at the parks this summer? We’re glad you asked. While Dance in the Parks serves as a summer home for the dance artists involved, its true beauty lies in its ability to expose the public to the wonders of concert dance in an environment that is close to and feels like home. For the last ten years, Dance in the Parks has performed in parks all over the city of Chicago. These performances employ professional dancers from the community paired with recognized and up-and-coming choreographers from Chicago and beyond. The works created in their month-long rehearsal process are performed outdoors in select Chicago Park District locations. While DIP serves as a summer home for the dance artists involved, its true beauty lies in its ability to expose the public to the wonders of concert dance in an environment that is close to and feels like home. Did we mention that these performances come at no cost to audience members? In a world of escalating ticket prices and an ever-shrinking pool of funds, Founder and Artistic Director Katie McCann continues to nurture and evolve her company while simultaneously providing under-served neighborhoods with the opportunity to experience the same quality of dance you would find in Chicago’s most iconic theaters. Prior to the kickoff of its tenth anniversary season, we sat down with Katie for a PRE-View of the performances to come. But, because we had so many more questions, we figured a full interview was the best way to go, and we couldn’t be more thrilled that Katie graciously agreed to it (especially since she and the company are in the midst of performances!). When I moved to Chicago in 2004, I saw that Chicago had an amazingly diverse dance community and a huge, active park district, but no one was combining the two. Kristi: Can you tell us about how Dance in the Parks came to be? What was the impetus for its founding, and how has the production evolved over the last ten seasons? Katie: I danced with Kentucky Ballet Theatre in Lexington, KY for three years. Every summer, Lexington Park District produced “Ballet Under the Stars” in collaboration with our company. We performed outside on a temporary stage built around a big tree, and hundreds of people would come out to see the show with their kids, dogs, and picnic dinners. Despite the heat and humidity, it was so much fun! I loved how kids danced along and adults interacted with the show differently than at shows in the opera house. Everyone was relaxed and not worried about behaving appropriately for high art in a theater. When I moved to Chicago in 2004, I saw that Chicago had an amazingly diverse dance community and a huge, active park district, but no one was combining the two. At the time, no dance companies were working during the summer, so there were dancers available to work. The park district reaches every neighborhood of the city and each park is used by its community all summer. It seemed like a no-brainer to put them together. Over the years, our season has grown to as many as 16 shows. We’ve hired 57 dancers, 54 choreographers and 13 designers and technicians. In ten years we’ve reached nearly 10,000 audience members. In 2009, I had a meeting with the Chicago Park District about producing an outdoor dance show. They gave me the go-ahead and use of the park district’s stage. I begged my friends to be a part of the project, and we managed to produce a show of eight pieces with 13 dancers, most of whom only committed to do one or two pieces. We were scheduled to do four shows but ended up doing three because of rain. Over the years, our season has grown to as many as 16 shows. We’ve hired 57 dancers, 54 choreographers and 13 designers and technicians. In ten years we’ve reached nearly 10,000 audience members. The creation of the Chicago Park District’s Night Out in the Parks initiative in 2012 was one of the biggest factors in our growth. The district had dedicated funds specifically for cultural events in all the parks. Our seasons jumped from four shows to ten, then to 16 because they had the budget to pay arts partners as well as the trades who transport and set up the stages. NOIP is dedicated to getting free, quality arts programming to all of the city’s neighborhoods, and the add-on value of that programming is that active parks are safer parks. We’re proud to be a partner to a program that makes communities better, both through arts programming and community-interaction. Kristi: Concert dance can be incredibly intimidating for new audience members. For many who venture out to a Dance in the Parks event, the performance they see is often their first glimpse at concert dance. What makes Dance in the Parks the perfect way to begin understanding and appreciating concert dance? We want to encourage audiences to participate in the dance community in any way that feels comfortable to them: by supporting local dance schools, by dancing themselves, or by the more traditional route of buying tickets to performances. Our productions are technically bare-bones: stage, sound system, dancers. Dance concerts in theaters are enhanced by lighting, a dark house, and air-conditioning. They create a very specific environment where the only thing an audience member can focus on is the dancing. Our shows, on the other hand, are in public spaces, in daylight, in whatever weather we’re having that day. There are so many distractions. For exactly that reason, our dancers and choreographers are all professional, Chicago-based artists who work with other companies during the traditional Fall-Spring dance season. They are all specifically invested in the mission of the company. The artists create compelling pieces of art and perform them in a way that overcomes the distractions of the venue. We want our productions to be entertaining, thought-provoking, and fun experiences that inspire interest and curiosity to encourage future interactions with the dance community. To encourage more interactions with Chicago dance events, we give away donated tickets to other professional dance events throughout the city at the end of each show (Hubbard Street, Joffrey, Auditorium Theatre, Harris Theater, and so many more). Additionally, we invite youth performance partners from each neighborhood to perform pieces on our program. We want to show off the talented youth dancers in each neighborhood, but also point audience members who might want to take classes to local resources. We want to encourage audiences to participate in the dance community in any way that feels comfortable to them: by supporting local dance schools, by dancing themselves, or by the more traditional route of buying tickets to performances. Dance in the Parks is happy to provide a place for experienced and up-and-coming choreographers to work without having to produce a whole show themselves. Kristi: This season, DIP features eight choreographers, eight dancers, and one apprentice. Can you give us some insight into how you select your dance-makers and cast? What is the rehearsal and preparation like leading up to the performances? Katie: I reach out to choreographers I would like to work with and who I think will be able to work within the constructs of our performances: short rehearsal periods, limited technical effects and outdoor weather considerations. Choreographers need to be flexible and work quickly. There are hundreds of choreographers in the city, but it’s hard for those professionals to create work with their professional dance peers and harder to get their work produced for the stage. Dance in the Parks is happy to provide a place for experienced and up-and-coming choreographers to work without having to produce a whole show themselves. We need artists who are smart, creative, quick to pick up, and cool under pressure. This year, six of our eight dancers are returning artists. Craig V Miller has been dancing with the company for seven seasons. Miranda Borkan, Katy Fedrigon, Irina Goldman, Jesse Hoisington, and Natalie Tursi are joining us for their second seasons, and Django Allegretti and Maxwell Perkins are new. We usually hold an audition for dancers but didn’t this year because we filled our company with mostly returning artists (the two new gentlemen reached out to me asking to be part of the season). When we do hold an audition, we’re looking for dancers highly-trained in contemporary, ballet, and modern styles. We need artists who are smart, creative, quick to pick up, and cool under pressure. Our audition process usually includes a ballet class, learning repertory, and some task-oriented improvisation and partnering. Many of our choreographers use the dancers in their creative process, and we need to see a willingness to dive in and try things as well as flexibility when we change the rules. This season, we had 24 rehearsal days to put together our eight-work show – that’s fast! Most of those days are spent in the studio with choreographers making things, and much fewer of those days are spent reviewing, cleaning, and getting comfortable with the material. Dance in the Parks dancers need to be quick, be willing to study rehearsal videos on their off-time and be team players. I am constantly impressed with the work the dancers do together in rehearsals to solve problems and make space for everyone to do their jobs. That feeling of teamwork is so important once we get to our performance venues, when everything is just a little bit harder: the weather is warm or rainy, the stage is on a weird slope, the changing tent is a million degrees, it’s windy, etc. Dance in the Parks dancers need to be good dancers, but the job is so much better when they’re kind people who are kind to each other. Kristi: Dance in the Parks 2018 features new works by an all-star lineup of choreographers, whose credits range from national tours to features on international stages. Can you tell us more about what they have created for this tenth anniversary season? Katie: For our tenth season show, five of our eight choreographers are returning artists: Joshua Blake Carter, Peter Carpenter, Lizzie MacKenzie, Thomas Mattingly, and Michel Rodriguez Cintra. Our three new choreographers – Becca Lemme, Paige Caldarella, and Mariana Oliviera – are experienced choreographers in Chicago and elsewhere. Two choreographers reset existing pieces. Cintra’s No More Games is a re-staging of a trio he made for our men last summer. The ladies wanted to do it, so I asked if he minded resetting it on the women for this summer – he loved the idea! Joshua Blake Carter created a finale called Our Town for us, last season. We are keeping the piece in repertory for a few years to be our finale. It’s his vision of summer in Chicago and incorporates our youth performance partners at the very end, so the show closes with the full cast dancing. Though all the pieces fall into the extremely broad category of “contemporary dance,” they’re all different. They all have different stories to tell and require different skills from the dancers. It’s a diverse program with something for everyone. The remaining six pieces are all modern and contemporary works of totally different themes, music styles, and moods. Peter Carpenter’s This is What Cooperation Could Look Like is a quintet that stems from his disappointment with the current political and cultural environment. Lizzie MacKenzie created another quintet, A Look Back, set to covers of Radiohead and Gotye by Postmodern Jukebox. Thomas Mattingly’s quartet, The Setup, is an entertaining romp about a couple set up on a date. Becca Lemme’s Brassy is an exciting (though physically grueling) trio to brass ensemble music. Paige Caldarella’s Durée is the season’s only full-cast piece and features movement created by her and the cast. Mariana Oliviera’s romantic duet I Lie is based on a Yiddish poem by Joseph Rolnik. We’ve become a part of the Chicago summer tradition and are recognized in the dance community. Park audiences look for us to return to their home parks, and dancers and choreographers reach out to be a part of the season. Kristi: What does the future hold for Dance in the Parks? What trajectory do you see for the growth and development of this program? Katie: We would love to do more shows in our month-long season and reach more neighborhood parks, but the logistics of adding more shows gets pretty expensive. Arts funding budgets are going down, so expansion is probably not our next step. And since part of our mission is to perform in neighborhoods that don’t or can’t support professional dance, that means we’re often in economically challenged neighborhoods which aren’t going to garner angel funders. However, every year our experience makes us better and we can add value to our existing shows. Our tenth season has been our smoothest, because dancers and volunteers have stepped up to help in new ways – running social media, coordinating youth partners, and planning a tenth anniversary party. We’ve added the inclusion of our youth partners in our finale number to showcase the span of the dance world from young students to pros. We have established relationships with institutions in the dance community that allow us to give away tickets to really amazing dance experiences. We’ve become a part of the Chicago summer tradition and are recognized in the dance community. Park audiences look for us to return to their home parks, and dancers and choreographers reach out to be a part of the season. Though we probably won’t ever grow much bigger as a seasonal company, we are able to make the show richer and, hopefully, more impactful for our audiences as we age. 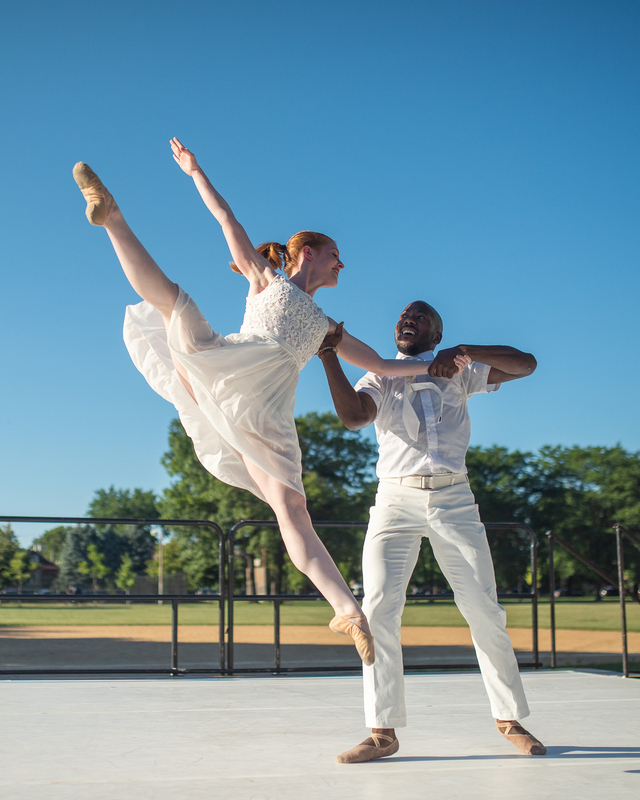 Dance in the Parks tenth anniversary season runs July 10 through August 3 in select Chicago Park District locations. To see the full 2018 season line-up and find the next Dance in the Parks performance near you, visit danceintheparks.org/performances. Learn more about Katie, the dancers, and choreographers by reading their bios at danceintheparks.org/artists. Follow Dance in the Parks on Facebook, Instagram, and Twitter to keep up with their artists as they perform throughout the city this summer.